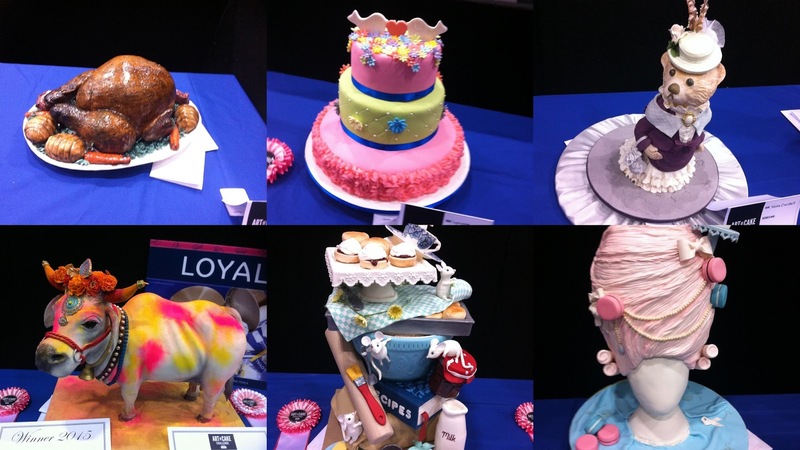 Last Saturday, I attended the Cake Bake & Sweets Show in Melbourne. I had a bright and early start, as I was doing a workshop class that started at 8.30am. The class that I chose to do was Katherine Sabbath's icecream cone cake course. For the uninitiated, Katherine is a Sydney high school teacher who became an Instagram sensation with her bright and colourful cakes. You can check out her creations here. In real life, Katherine is sweet and bubbly and enthusiastic - the nicest instructor I have ever had in a baking class. We made her famous icecream cone cake on a foam dummy - my effort is pictured at the top of this post. 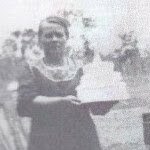 Katherine also provided her cake recipe on request so that if you want to try it at home with real cake, you can. This little beauty was delicious; I shared it with Tim. However, it looked quite watery and not very appetising. It is Halloween tomorrow, so to get into the spirit of the season, I wanted to bake something Halloween-ish. Recently, Lorraine of Not Quite Nigella made these Day of the Dead Cookies; I loved them and I had the cutters, so I decided to make them. Lorraine decorated her cookies with gel pens. I knew I would have transport issues if I used those, so I used edible markers instead. They were fun to make, even if the decorating process took quite a while. The cookies themselves are delicious. If you are looking for a fun but tasty item to bake for Halloween, I can highly recommend these cookies. 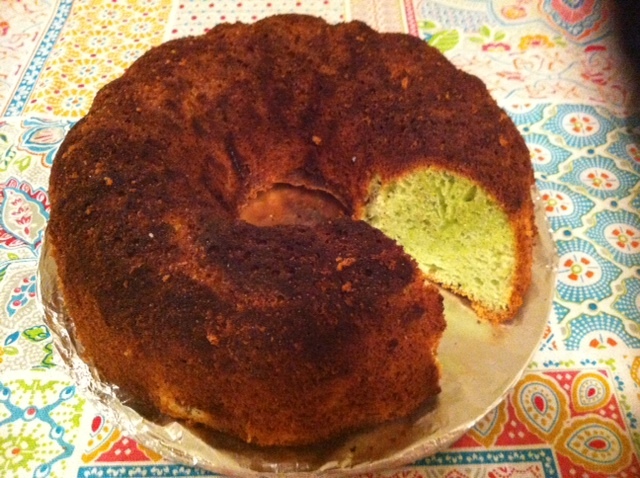 Recently, my colleague, Sally, asked if I would try to make a pandan chiffon cake. Sally is originally from Singapore, where pandan chiffon cake is a popular treat. She even recommended a recipe, being this one. I decided to take up the challenge, and this post documents the results. I didn't use pandan leaves - I just used pandan essence and green colouring. I overbaked it a little (the 55 minutes in the recipe ended up being too long), but otherwise, I was happy with it. 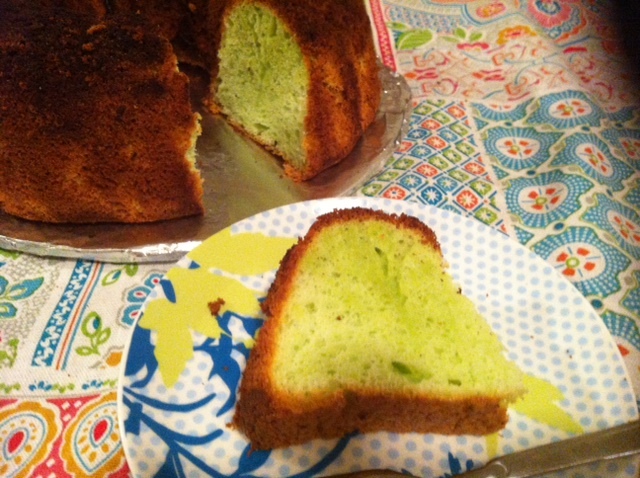 I asked my colleague, Swee, what she thought of it, as she is familiar with pandan chiffon cake. She said the flavour was good, but it was a little denser than it should have been. That's an OK assessment from my perspective, given that I have never previously eaten pandan chiffon cake, so I have nothing to compare it to. I used a bundt tin rather than a ring mould to bake the cake as I wasn't going to buy a special tin for this trial. I quite liked the flavour of this cake, which was more interesting than an angel food cake from my perspective. If I have a lot of eggs (it uses 9 eggs) and someone asks me, I might make pandan chiffon cake again. For Wednesdays with Donna Hay this week, Kayte chose Thai Chicken San Choy Bau. I am a fan of the Chinese equivalent, so I was happy to make these. The san choy bau were delicious. The chicken mince is chilli spiced to give it some kick, so was quite tasty even without the lettuce cups. It is also quite a colourful dish. This dish is quick and easy to make as well, which has much to recommend it. To see what the other group members thought of this dish, visit the LYL section of the WWDH website. Our Tuesdays with Dorie recipe this week was apple pielets. 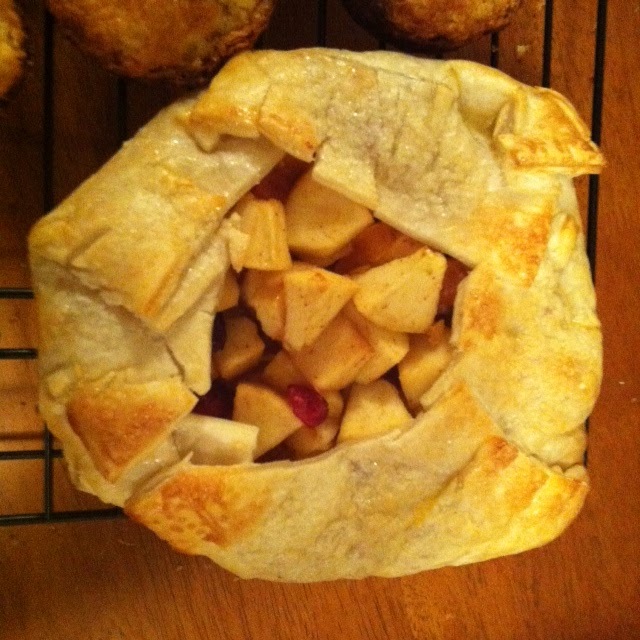 These are, as the name suggests, tiny apple pies baked in muffin tins. These little pielets smelled so buttery and good, and tasted just like they smelled. 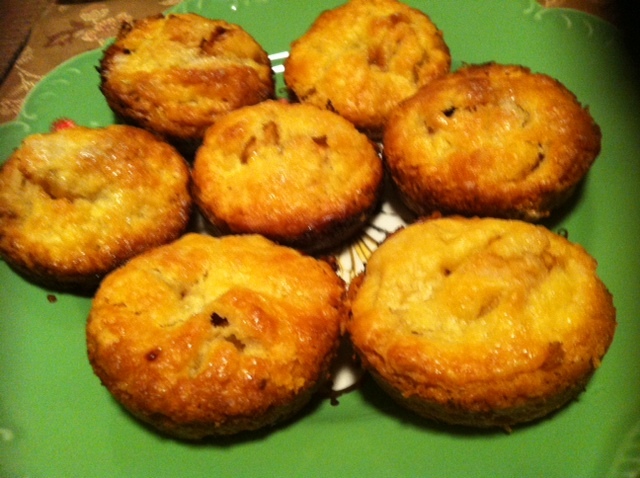 To see what the rest of the group thought of these little pie, visit the LYL section of the TWD website. Today is Sue's last day at work with us. To send her on her way, I made her a going away cake. I had wanted to make the Carrot and Cardamom Cake from The New Nordic cookbook for a while (recipe online here), so this was a good opportunity to get around to it. The cake smelled amazing while it was baking. All of the spice smells wafted through the house, creating the most enticing aroma. It was all I could do not to just dive in! 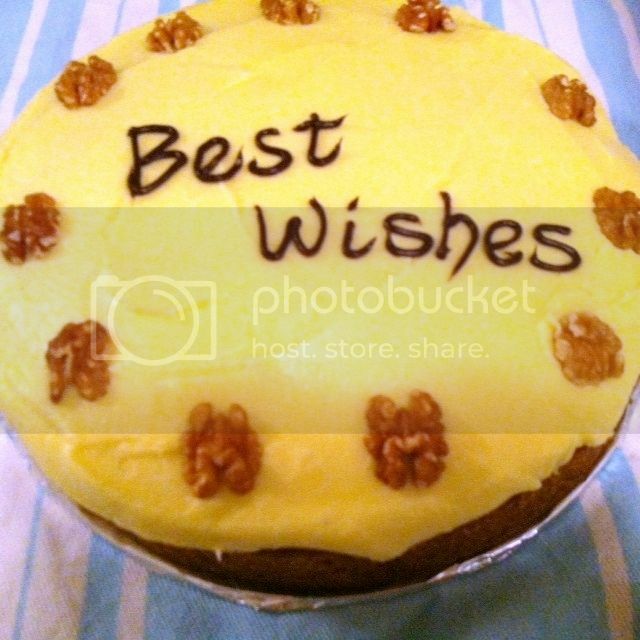 I made this on a weeknight so the decorations are simple - Queen chocolate writing icing (which seems to work much better in the warmer weather when it isn't gummed up in the tube) and whole walnuts. I was pretty happy with the result, especially as it was not a night that I wanted to be baking. Wishing Sue all the very best in her new adventures! It is a double billing for me this week, as I also chose our Eating with Ellie dish, Orange-Sesame Chicken Stir Fry with Snow Peas. Stir fries are on regular rotation at my place as they are quick and easy. However, this one was something else. The sauce was based on orange juice and chicken stock, and toasted sesame seeds are liberally scattered on top of the chicken and snow peas. As suggested by Ellie, I served the stir fry on a bed of brown rice. I have to say this is one of the best things I have ever tasted, and certainly the best stir fry I have made in a long time. I pretty much go on auto pilot with the same sauce and similar veges in my stir fires all the time, but this version was different - sweet and nutty, almost like eating a Snickers bar in stir fry form, if that makes sense. This one is a definite keeper. To see what the others thought of this stir fry, visit the LYL section of the EwE website. For Wednesday with Donna Hay this week, I chose Roasted Brussels Sprouts with Parmesan and Vincotto from the June/July 2015 edition of Donna Hay magazine. I made these in the winter to have with a slow cooker dish. To make these Brussels sprouts is so simple - drizzle with oil and sprinkle with salt and pepper, roast for 30 minutes covered, then 20 minutes uncovered, and in the last 10 minutes, add some chilli flakes and parmesan, and serve drizzled with vincotto. Simple, tasty, no fuss. To see what the others thought of this dish, visit the LYL section of the WWDH website. For Justine's birthday, we all went to lunch at Red Spice Road. I have been there a couple of times before, and have even blogged about it here. We ordered the Express Lunch Menu with the chicken wing appetizer and three mains for $29.50. Looking back at my old post, I was surprised by how much the food has changed in five years. I understand that the lunch menu morphs every two weeks. The best way to eat these was with your fingers. The chicken wings had a lovely salty-sweet flavour. This was a very rich offering, with large chunks of pork belly swimming in a delicious chilli caramel sauce, and served with a sharp, crisp apple slaw to cut through the richness of the meat. Seriously good, but very filling. This bright and colourful dish had just the right amount of heat and won me over as the dish of the day. This curry was delicious, and had a fair bit of heat. I do love a good curry. My colleagues raved about the food here, so I was pleased as it was my choice. I think the food gets better every time I go, and I always eat way too much. If you love Asian flavours, then consider dropping by Red Spice Road. My colleague, Justine, had her birthday on 3 October, while she was on vacation in France. On her return this week, we celebrated belatedly with her at work. 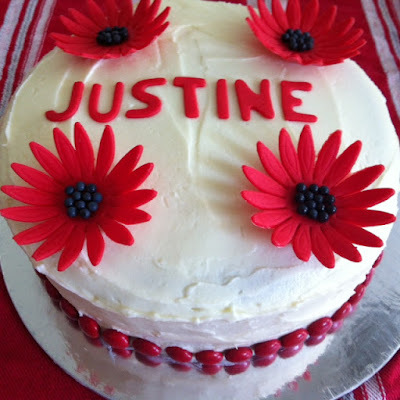 Justine's favourite colour is red, and she wears a lot of it. This was the inspiration for this cake - can you tell? The cake itself was my favourite red velvet cake recipe from Sweet and Vicious by Libby Summers. You know how much I love this cake because I have made it twice before - here and here. This time, I decorated the cake with my favourite Primrose Bakery vanilla buttercream instead of cream cheese frosting because I made the cake in advance and needed to store it outside of the fridge - rolled fondant and fridges don't mix. I made the red decorations from red rolled fondant (tip - it's easier to buy strong colours of icing already made up) and a daisy punch cutter, with black seed pearls glued on with a little water for the centres. I was going to leave it there (I was over rolling fondant), but it looked a little incomplete, so I found out some red M&Ms that I had leftover from RSPCA Cupcake Day and placed them around the bottom edge of the cake. Perfect! It's delish, so I was very happy to eat it all. Justine said that she enjoyed n the end, that's all that counts. We loved both dishes - they were winners, as we love South East Asian inspired flavours. It was a lovely, balmy evening with delicious food. What more could you want? For Eating with Ellie this week, Peggy chose Mini Pumpkin Jar Cakes. The jar cake/mug cake is currently having a moment, so these cakes fit in well with that. The cakes are quick and easy to make. I didn't have canned pumpkin puree (which is a rare commodity in Australia), so I boiled and mashed a small piece of Kent pumpkin. The resulting cakes can't be described as pretty, and they will never replace a traditionally made cake in flavour and texture, but if you want a quick easy dessert and don't have the time or energy for anything laborious, then these tasty little cakes fit the bill. 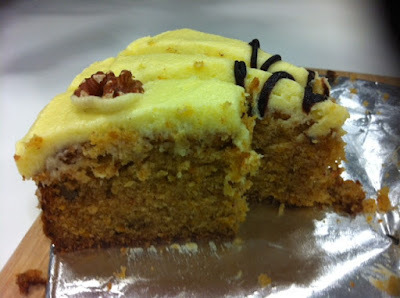 To see what the others thought of these cakes, visit the LYL section of the Eating with Ellie website. Glennis chose Donna's Chocolate, Banana, and Coconut Muffins for this week's Wednesday with Donna Hay. If you are interested in making them and don't have the June/July 2015 edition of Donna Hay magazine, someone has posted the recipe online here. For me, the recipe made 18 muffins. I didn't try these muffins until they were cool, and I found the flavour distinctly unexciting. However, I read the review here which said that they tasted best straight out of the oven and not as good when cool. I tested this theory and found that I agreed - they are very tasty warm, with big chunks of oozy chocolate and toasty coconut, but meh when they are cold. To see what the others thought of these muffins, visit the LYL section of the WWDH website. Our Tuesdays with Dorie recipe this week is the intriguingly named Tiger Cakes. Apparently these cakes are common all over France, and are normally served upside down with a rosette of ganache on top. At a stretch, they could be said to resemble a leopard's spots. However, it's a fun name anyway. These cakes taste delightful - loved this recipe with egg whites, almond meal, chocolate and a scant amount of flour. They taste good just slightly warm while the chocolate is still soft. I would make these again. To see what the others thought of these cakes, visit the LYL section of the TWD website. 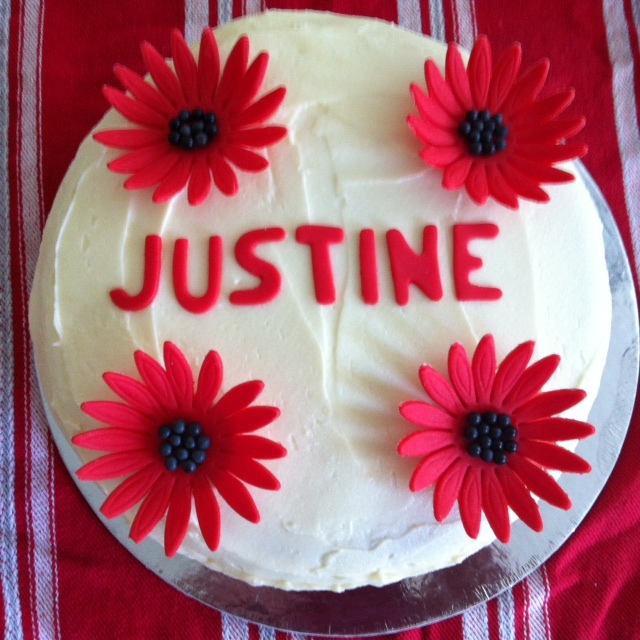 Last Thursday night saw my third meeting of The Melbourne Cake Club. Our theme this month was Flowers. For my contribution, I made an Elderflower and Lemon Drizzle Cake from a recipe I found online here. Just as the photo of the cake only has two layers, not four, I did likewise. I really enjoyed the subtle flavours of the elderflower cordial and the lemon curd and juice in this cake. The syrup used to soak the cake while it was still warm added extra flavour and moistness to a delicious, sponge-style cake. It was the perfect spring cake, in my view. It was a very refreshing drink. It was another fun evening at The Melbourne Club. Next month's theme - Cocktails!